We got a new fishy addition to our family last week... so we've spent a lot of time admiring our fishbowl. This project paired my little guys two favorite things this week: painting and fish, so it was a success! Materials Needed: green tissue paper, 3 pieces of white candstock, 1 piece each of black and yellow cardstock, paint, paint brush, scissors, glue stick, and a pencil. 1. Cover one piece of cardstock with blue paint. We used two colors of blue paint and two types of brushes (Do-A-Dot dotters and a foam brush). 2. While your toddler paints, draw fish on two other pieces of cardstock (I used white and yellow). 3. Have your toddler paint the fish several different colors. We used our dotters for this. 4. While your toddler paints, fold a white piece of cardstock in half and draw a fishbowl outline. 5. Cut out the bowl, open it, and trace the bowl onto the back of the blue paint covered paper. Cut the blue paper so that it fits the bottom of the fishbowl. 6. Have your toddler cover the back of the blue "water" paper with glue and stick it onto the fishbowl. Halfway through this activity my little guy wanted go do his "project" outside because the weather was so gorgeous! Trying to keep his attention once we got outside was a bit tricky, but he loved running around and then coming back to finish the project. 7. While my little guy ran around, I cut out the fish once they were dried. 8. Have your child rip up some green tissue paper to use as a fishbowl plant. 9. After the fish are cut out and the tissue is ripped up, have your toddler put glue on the back and then stick them onto the fishbowl. and we admired all the fishies!!! - Talk about colors, shapes, and textures that you see and feel while building this fishbowl. 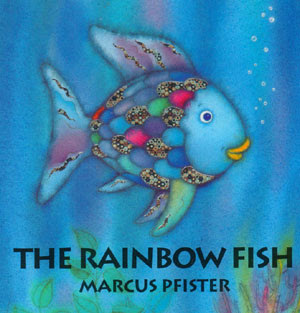 - Read The Rainbow Fish by Marcus Pfister and talk about friends and sharing. 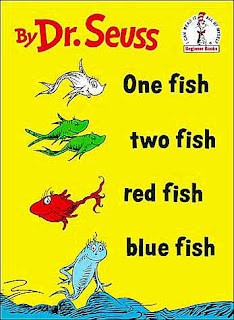 - Read One Fish, Two Fish, Red Fish, Blue Fish by Dr. Seuss and find rhyming words and learn some new vocabulary words. 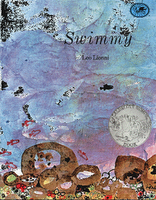 - Read Swimmy by Leo Lionni- I loved reading this book with my little students when we learned about ocean animals. - Try out this School of Fish game by No Time for Flashcards to practice the letters of the alphabet. For older kids you could write words on the fish and have them fish for specific words. You could also have rhyming words and have kids fish for the rhyming pairs. Watch us give our tails a Swish! We're happy as can be. Wouldn't it be fun to make this fish paper bag puppet or these shimmering fish puppets and then sing while you swish your little fish puppet's tail? Doing several activities along with your fishbowl art project will help your child learn more vocabulary words and get a better understanding for what those words means as he sees several examples of them or hears them repeated in different contexts. We also love to go to fish ponds, pet stores, and aquariums to see more fish and talk about all the colors, shapes, and sizes that we see. Have fun!